"The popular image of the Middle Ages comes from fairy tales and romances. This witty animated short challenges some enduring myths about medieval women and shows what their lives were really like. It explores the differences and similarities between that distant period and our own." National Film Board of Canada. 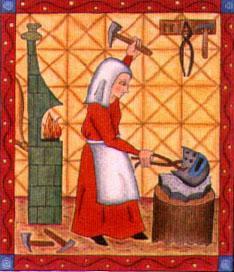 "NFB -- Illuminated Lives: A Brief History of Women's Work in the Middle Ages." National Film Board of Canada. http://onf-nfb.gc.ca/en/our-collection/?idfilm=18026.